Last week I had a delightful dinner at Tra Vigne Restaurant in Napa Valley with the owner of Silenus Vintners (www.silenusvintners.com). This winery makes small lots of artisan wine as part of a custom crush operation, and the cabernets and chardonnays he shared over dinner were rich, concentrated, and fulfilling. When I asked him what “Silenus” meant, he said that he was a Greek god who was the tutor and faithful companion to Dionysus. The conversation reminded me of the article I wrote last year about wine goddesses. It was at a time when I started wondering why we always heard about wine gods, but never the female version. Since women consume more wine than men, this started to bother me. Eventually I did some research on the subject and published a short article in Wayward Tendrils Quarterly (Vol 18, No. 2, April 2008) which I am reprinting here with permission from the publisher. It highlights wine goddesses from around the world. Most historians now agree that wine was most likely discovered by a woman. However what is often left out of the history books are the ancient stories of the goddesses of wine – most who came into being centuries before Bacchus and Dionysus. Modern technology and carbon-dating has helped us prove that wine from cultivated grapes was being made in what is now modern-day Georgia, in the Caucasus Mountains around 6,000 B.C. There are also reports of wine remains in Armenia, Turkey, Iraq, Iran and China which claim to be older than those found in Georgia – though there is some confusion over whether it is grape, rice, date, or honey wine. Regardless of the birthplace of wine, it is commonly agreed that because women were involved in the gathering of berries, grapes, and other crops that it was most likely a woman who picked some grapes and placed them in a pottery container in a cool dark corner. When she remembered to check the container a few weeks later, she found a fermented beverage that had a delightful flavor and a pleasant inebriating effect. Thus wine was born. From Persia, there is an ancient legend documented in the Epic of Gilgamish that supports a woman discovering wine. She was a member of the harem in the palace of King Jamshid, and she suffered from severe migraine headaches. One day the king found that a jar containing his favorite grapes had a strange smell and was foaming. Alarmed he ordered that it be set aside as unsafe to eat. When the woman heard of this, she decided to drink from the container in an effort to end her life with the poison inside. Instead she found the taste of the beverage very delightful. Furthermore, it cured her headache and put her in a joyful mood. When she told King Jamshid, he tasted the “wine” as well and then ordered that more should be made and shared with the whole court. It was from this same part of the world, in the Sumerian Empire in what is modern-day Iraq, that the most ancient goddess of wine is first mentioned. Her name was Gestin and she was being worshiped as early as 3000 BC. Gestin, which translates as wine, vine, and/or grape, is also mentioned in the ancient Indus manuscript, the Rig Veda. Experts believe that it is quite reasonable that the first gods of wine were women, because the oldest deities were female agriculture goddesses of the earth and fertility. Gestin was most likely born from this agriculture base and over the centuries came to represent wine. Later, in 1500 BC, we find mention of another wine goddess, Paget, in the same part of the world. The clay tablets refer to her as working in the vineyard and helping to make wine. Then around 300 to 400 BC as wine became more prominent in Sumeria, a new wine goddess, Siduri, is described as living near the city of Ur. She is reported as welcoming the hero in the Epic of Gilgamish to a garden with the tree of life which is hung with ruby red fruit with tendrils. Siduri is referred to as the Maker of Wine. Across the deserts in Egypt the wine goddess Renen-utet is mentioned on hieroglyphic tablets as blessing the wine as early as 1300 BC. Interestingly she is known as both a wine and snake goddess. She usually had a small shrine near the wine press and often her figure would appear on the spout where the grape juice flowed into the receiving tank. She is sometimes joined by Ernutet, the Egyptian goddess of plenty, in blessing the grape harvest. What is intriguing about these wine goddesses is how little is known about them, whereas Dionysus and Bacchus have much more coverage in the literature. It is possible that this is because they are more recent. The earliest records of Dionysus, the Greek wine god, show he appeared around 500BC in the Greek Islands, whereas Gestin dates from 3000 BC. However, the concept of Dionysus, as a child god who was born of a mortal woman and a god, is very ancient and can be traced back 9000 years. These depictions however -- which are amazingly similar to the images of Mother Mary with the Baby Jesus – do not include wine. Dionysus as a wine god came later. Indeed, another legend says that Dionysus came from the lands near Sumeria to the islands of Greece. Is Dionysus somehow connected with Gestin, Paget and Siduri? Bacchus, the Roman name for Dionysus, became known in the literature around 200 BC as the Greek Empire was fading. Other wine gods included Osiris from Egypt and I-Ti from China. So what are the implications of these ancient connections between women and wine? Why have the ancient wine goddesses been lost in the history of time? Is it because the culture changed towards a more masculine image, which gave rise to the male wine gods? Is this why in the period of the Roman Empire, women were banned from drinking wine? Indeed, a husband who caught his wife drinking wine could legally kill her on the spot. And the depiction of the raging Bacchanalia rites, in which women chased after Bacchus in drunken ecstasy while they tore animals to shreds is hardly flattering to women. 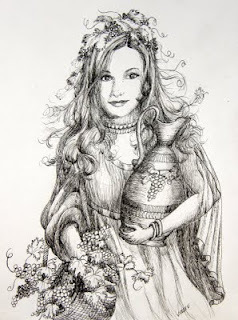 So perhaps it is time to resurrect the image of the ancient wine goddesses, and the blessings of a plentiful harvest and the joy that wine can bring in moderation. After all, the cultural tides of the world have changed again, and today in wine-drinking countries, women are the primary purchasers of wine. The connection between women and wine has always been there. Today it is growing stronger, with a focus on friendship, romance, health and balance.